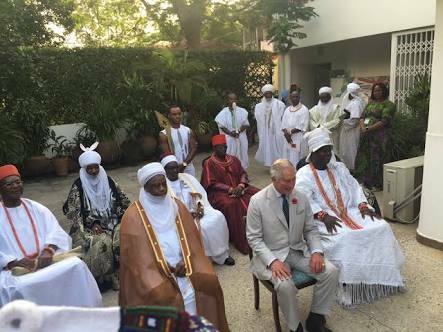 The Prince of Wales, Prince Charles on Tuesday met with some traditional leaders. Speaking with newsmen, following closed-door meeting, the Emir of Kano, Muhammed Sanusi II said the Prince gave a brief summary of discussions held with President Muhammadu Buhari on a range of issues, from climate change to demographic explosion. Sanusi said that the proper education of the girl-child would address the issue of demographics in the country. “We talked about town planning. Now take the north for example We have had a huge demographic explosion in the last 40 to 50 years but we have not yet changed the way we build our houses. “So every time there is pressure for housing, the government takes over farmlands. Very soon we will not have enough farmland to feed Kano and we are not going to have grazing routes. “We have got to start thinking how we could build vertically so that more families live on one plot, we free up the land, improve the yield on agriculture and begin to confront some of these challenges of demographics. “Educating the girl child basically kills so many birds with one stone; we had a conversation around and the whole idea is how to work with the British Government in dealing with these issues and see how we can learn from each other’s experience,” the Emir said. The Oba of Benin, Omo N’Oba Ewuare II also told newsmen that the issues of human trafficking and youth empowerment were discussed adding that “I made my commitments”. The seven traditional leaders received by Prince Charles are the Obi of Onitsha, Nnaemeka Achebe; Etsu Nupe, Alhaji Yahaya Abubakar and the Emir of Kano, Muhammad Sanusi II. Others are the Oba of Benin, Omo N’Oba Ewuare II; Shehu of Borno, Gabai El-Kanemi; Ooni of Ife, Oba Adeyeye Enitan Ogunwusi (Ojaja II) and the Sultan of Sokoto, Sa’ad Abubakar III.